Somoto Toolbar, BetterInstaller, FaceSmooch, FileBulldog, CrunchBaseDealBulldog Toolbar is a browser application promoted at dealbulldog.somotoinc.com. Only Mozilla Firefox and Internet Explorer browser users can install the toolbar; however, the installer on the official website does not work at the moment. Due to this, malware researchers believe that this program could be bundled with untrustworthy freeware. Whether you have discovered the application entering with or without permission, we suggest having it deleted. DealBulldog Toolbar removal is represented within this article. The distribution of DealBulldog Toolbar is truly questionable. Has it been installed illegally? Did it come bundled with malicious or intrusive applications? Do you need to remove the additionally bundled programs from the operating system? These are the questions you should bring up as soon as DealBulldog Toolbar starts running on the computer. Needless to say, the removal of the toolbar itself depends on what other threats are active. All in all, if you do not delete it, there is a possibility that you will face serious risks. It is no surprise that DealBulldog Toolbar is identified as adware (advertisement-supported software). The application designed by Somoto Ltd. works just like FaceSmooch and FileBulldog, both of which should be deleted from the browsers. 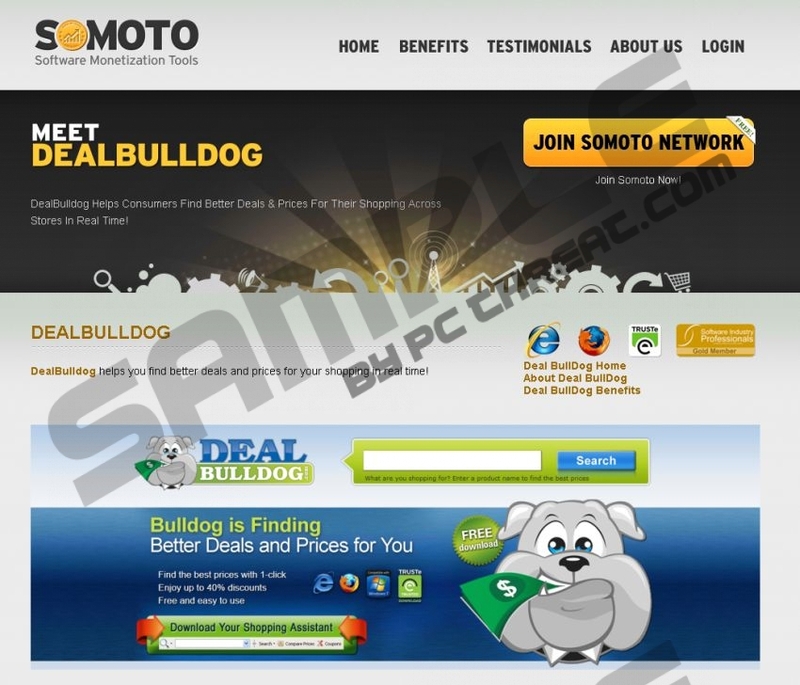 In fact, links to the download pages of these applications, alongside Somoto Toolbar, BetterInstaller and CrunchBase are represented on dealbulldog.somotoinc.com. Malware researchers warn that all of these applications deserve removal because they are linked to questionable online deals and parties representing them. Do you believe that all of the presented ads are screened and picked accordingly to your needs? Unfortunately, they are not. The advertisements linked to DealBulldog Toolbar may seem interesting; however, the initial offers may have nothing to do with real, beneficial offers. In fact, it is more likely that once you click on the displayed ads, you will active rerouting to third-party shopping sites, search engines, and generally unreliable sources. If you do not remove adware and then proceed clicking on the unreliable ads, you have to be most careful with the suggested installers and interactive offers, such as surveys or prize giveaways. Do not share personal information and do not install software which may turn out to be malicious. These are the main reasons behind DealBulldog Toolbar removal. Even though DealBulldog is meant to find better deals and prices for your shopping, this advertisement-supported program is much more likely to present unreliable and useless offers. In the worst case scenario, the displayed ads may hide various scams and links to unreliable sites. Due to these risks, it is believed that all computer users should delete DealBulldog Toolbar. Follow the instructions listed below and utilize an automatic malware remover to delete remaining threats and reinstate authoritative Windows protection. Click the Start button on the Task Bar to open a menu. Now select Control Panel and click Add or Remove Programs. Move to the Task Bar and click the Windows button on the left. Find the program you have chosen to delete, right-click it and select Uninstall. Click Extensions in the Add-ons Manager menu on the left. Click Manage Add-ons and then select Toolbars and Extensions. Disable the undesirable applications and click Close. Quick & tested solution for DealBulldog Toolbar removal.